The War on Terror has not been very helpful to the War on Drugs, with reports emerging that opium poppy production is hitting new highs in Afghanistan since the Taliban were running the country over a decade ago. How does this happen? Does Afghanistan have absolutely no other economic prospects other than producing a substance that wrecks havoc both on the native population and on millions of people addicted to its derivatives (heroin) overseas? The United States has spent $7.6 billion to counter the spread of narcotics even as its soldiers provide security for the Afghan opium poppy fields (as seen in the picture below). Two very diametrically opposed circumstances that should raise red flags. 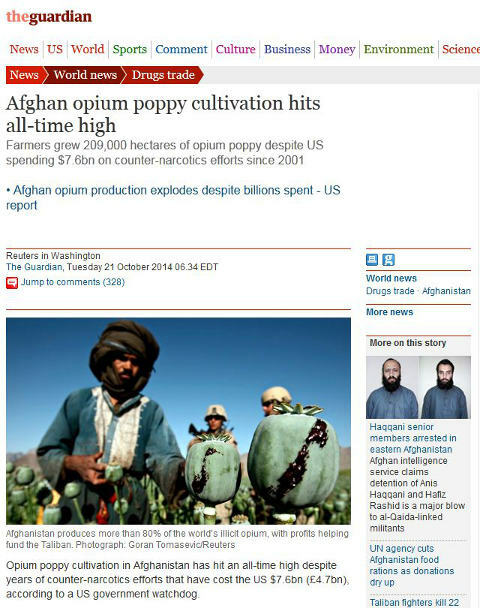 “In past years, surges in opium poppy cultivation have been met by a coordinated response from the US government and coalition partners, which has led to a temporary decline in levels of opium production,” Sopko said in a letter to the secretary of state, John Kerry, the defense secretary, Chuck Hagel, and other top US officials. “The recent record-high level of poppy cultivation calls into question the long-term effectiveness and sustainability of those prior efforts,” he said on Tuesday. Afghanistan produces more than 80% of the world’s illicit opium, and profits from the illegal trade help fund the Taliban insurgency. US government officials blame poppy production for fueling corruption and instability, undermining good government and subverting the legal economy. As the United States and its newest “coalition of the willing” shift their anti-terrorism focus to Syria, Iraq and ISIL/ISIS, risks emerge within the “old hot zone” of Afghanistan and Pakistan. 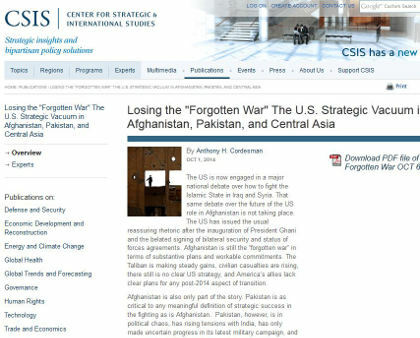 Anthony Cordesman of The Center for Strategic and International Studies has delved into this subject with a recently published paper.